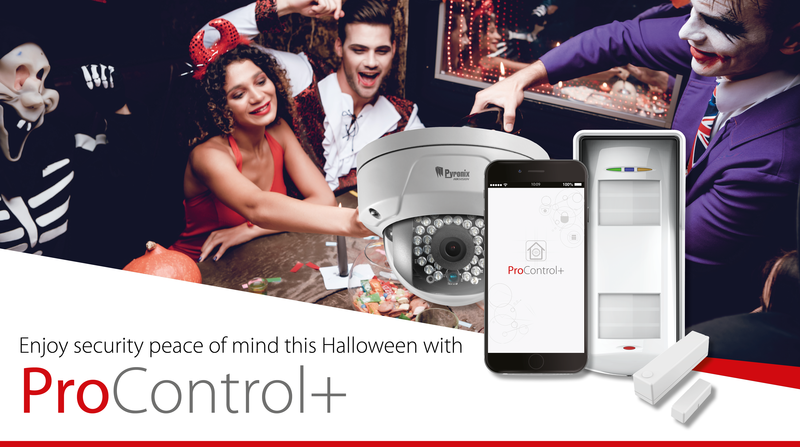 As the nights continue to draw in and people prepare to go trick or treating, you can provide them with complete confidence and peace of mind that their property is safe and secure. How? With the fully-integrated Enforcer V10, ProControl+ and the complete range of Full-HD Wi-Fi/PoE Cameras. Together, this security system seamlessly provides your users with the ability to remotely set, unset and video monitor their property from anywhere, anytime, as well as receive voice push notifications that will give them early warnings and grab their attention should any events occur. With easy installation thanks to multi-award-winning two-way wireless technology, the entire range of Pyronix security peripherals and the Pyronix range of Full-HD Wi-Fi/PoE Cameras offer outstanding flexibility to tailor the system. This means you can deliver a system which perfectly meets the security requirements, as well as the desired function of the user, for every installation. For perimeter protection, simply utilise the XDL12TT-WE detector, alongside the outdoor Wi-Fi Mini Dome Camera to offer your users reliable and robust outdoor detection, with video monitoring, early warning and verification capability. So, whether goblins, ghouls, werewolves or any other intruder approaches the user’s property, outbuilding or garage, the XDL12TT-WE, featuring long range signalling, Anti-Sway Analytics, Tri-Signal Detection Logic and Dual-Vision Pet Immune, will detect them and inform the panel. The Enforcer V10, which comes with Wi-Fi communication as standard, will then instantaneously send an early warning voice push notification directly to the user, via the ProControl+ smart device application, alerting them that the perimeter has been breached. On receiving the voice push notification, the alerted user can simply switch to video and see exactly what is happening in clear HD, even in the dark. Therefore, the system will detect, notify and offer the ability to verify the event to the user, before any break-in attempt can even take place. Such functionality can be added throughout the property, utilising indoor KX detectors, contacts, break-glass sensors, as well as the indoor Wi-Fi/PoE Cube Camera or indoor Wi-Fi/PoE PT Dome Camera. There are even life safety sensors that will detect and alert of any fires, the presence of dangerous carbon monoxide gas or if there are any water leaks. These devices, alongside the ProControl+ and its wide range of voice push notifications keeps the user perfectly informed, no matter where they are. So, should there be any bumps in the night, or any unwanted visitors creeping around this Halloween, you can rest assured that your users are safe and secure.